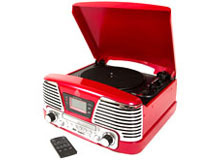 GPO Guide to Vinyl - Offical Manufacturer of Stylish Retro Products. Here at GPO we design and manufacture record players for you to enjoy and appreciate. We’re in the middle of a vinyl revival and for those of us who remember buying LPs and 7 inches the first time round, it's good to see. However, we also know it's a new/old piece of technology with as many quirks as a tablet. What do you need to know before you choose the right record player for you? How do you care for vinyl? These are some of the questions we've been asked by enough customers that we thought we'd put it into a simple guide. The first thing you need to know is that vinyl is delicate and incredibly easy to scratch. It needs to be looked after. When you're choosing a record player, you'll need to think about what size you want and how much space you have, also how many add-ons and accessories you want. How much of your music is on vinyl and how much is on a digital format? Connectivity is important. You might want to record your vinyl onto a computer or mass storage device to preserve your favourite songs, so look for a record player with our conversion software built in. Perhaps you want a music system that allows you to play records but also CDs and your MP3 player, so make sure the product you purchase will support all these formats by checking there is a 3.5mm aux out or the correct functions to support these. Remember, as with any technology, a higher price means you get more features and accessories than you do at entry level. The GPO Stylo is our entry level player retailing at £39.95 that supports three speeds, has built in speakers & AUX in port. As you move up the range the features and technical specifications increase. What do you want a record player for? Your need will influence how much you spend and what features you're looking for on a record player. If you want to connect and play your music in different formats, then you'll have to buy a high end player with USB and jack plug features to plug in different devices. Perhaps you're just testing the water with vinyl so opt for a lower priced unit. Just like with any technology, there's a lot of jargon around record players. Here at GPO we feel that it is important for our customers understand what this means. Belt-drive or direct drive. You'll find a lot of debate about which is the better system to go for on a turntable. The difference relates to how the turntable spins on what's called the "platter". On a belt-drive the platter rests on top of a bearing as it rotates. The motor will be to one side. The platter connects to a motor that in turn spins the belt. The belt itself can help protect the motor and the platter creating a smoother sound. Turntable mats. If you think of the record spinning on a turntable you want to make it as secure as possible. A turntable mat helps to keep the record in place and reduces any movement and vibration. This makes for a more consistent playback. Tone arm and weight. Turntables can be temperamental. There are so many factors and parts, you need to get everything right before you play. One of the most important factors is weight. A record is a series of circular grooves. The needle moves along the grooves to play the music. So it makes sense, therefore, that to play the music correctly, the tone arm needs to be weighted just right so that the needle sits perfectly in that groove; too much and the record will stop and be damaged, too little and the arm will jump from groove to groove which is how you get scratching or jumping. GPO's turntables come ready assembled, but when you're making your choice ask about tone arm and weight. A higher end record player will have a more solid weight in the arm and provide better playback, it's one of the features you pay for with a high end player. The more basic the unit the lighter the components may be. Stylus. The needle at the end of the tone arm is what tracks through the record grooves. You might need to replace your stylus if records are jumping or skipping. We stock replacements online and with our resellers. Speeds. Turntables play at three different speeds; 33, 45 and 78 RPM. This determines how fast a record should spin depending on how it was recorded. What does vinyl sound like? Musicians from Jack White to Dave Grohl will tell you how much they love the sound of vinyl. For a generation that's grown up with digital recordings, vinyl sounds stark; it's a richer and grittier sound. There's a great deal of depth as a digital recording can sound "flat". The surface noise as you put the needle into the groove is nostalgic and it's a scene setter for listening to music. Also, and importantly, there's a performance involved in playing a record, from taking the LP out of its sleeve to placing it on the turntable. A record player makes music a bit more fun. Want to try the rich, gritty sound of a vinyl on a digital device? 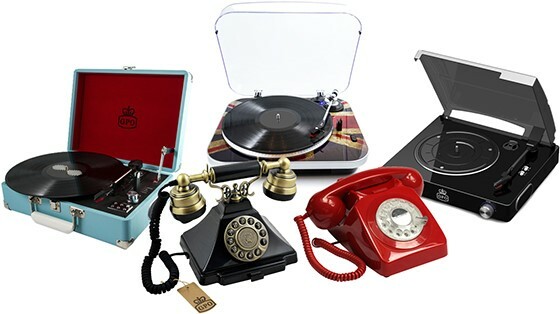 Choose one of our record players that come with built in recording technology; all you need is a USB stick. If you're used to playing music on digital formats you're probably used to that music system, being quite robust. A vinyl record isn't the same. Vinyl is incredibly delicate so you'll need to care for it. Once it's scratched, that's it, you can't repair it. Vinyl is also lighter than it used to be so you have to be extra careful. 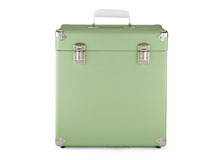 Think about where you're going to keep your vinyl, perhaps a special box like our new vinyl case. Don't put it near heat or in direct sunlight as this can warp the record. Only clean your vinyl with a specialised cleaner and brush. Don't use spray or moisture unless it's a special fluid. Don't use your t-shirt. Vinyl may look sturdy but actually it's more like a malleable plastic. If you're listening to older vinyl from your collection, you'll find the grooves on the records themselves are deeper and the records heavier. You'll be able to play them on any kind of turntable. However, newer vinyl is lighter with shallower grooves which might affect playback on turntables without weighted arms. When choosing where to keep your record player, there are a few things to consider. Make sure that it is placed on a flat surface and out of direct sunlight. The slightest vibration can affect the quality of sound out of your record player as it causes the needle to jump, so make sure that there are not external speakers on top of, or right next to the unit. Be gentle with the components, using the small leaver next to the arm to lift and lower onto the records. After you've finished using your record player, make sure to turn the unit off and disconnect it from your external power source. Close you dust cover, or the lid if it's an Attache, to ensure that nothing unwanted gets inside. Remember to place the plastic cap over the needle as it is extremely delicate. If your vinyl records are skipping the first thing you need to do is check your records for any scratches or dirt, this can affect the sound quality of your record massively. If your records are fine, your next port of call should be your supplier. Skipping can be caused either by the needle, the vinyl itself or the arm of the record player. Newer pressed vinyl has shallower grooves and the vinyl is lighter so it's easier to skip from groove to groove. A needle may be damaged or the arm might need more weight. Your supplier can go through each of these issues with you and provide a replacement record player or stylus if you need one. An old trick, way back when, used to be to put a little blu-tac onto the tone arm to add a little bit more weight. It's a high risk strategy as it can scratch your vinyl but it was often the first remedy people used back in the 70s. If you can test both new and old vinyl on your record player e.g., vinyl LPs from the 70s/80s and 2015 vinyl records you can figure out if it is a vinyl issue or in fact your record player. It's worth telling your supplier the exact LPs causing problems as they can test those in the factory with the record player. If you think you need a new needle, contact any GPO stockist. The majority of our stockists will have replacement needles. You can also buy them from the online store of our website. With the GPO Stylo, make sure you turn the volume dial around far enough until you hear a "click". If it's your GPO Attache, perhaps you need a new power cable. Each detachable power cord comes with a 12 month warranty so contact the GPO Office on 0330 024 0383 and we will be able to help you out! If you're recording onto a USB then it will need to be blank before you record onto it to ensure that there is enough memory for your music. Please be aware that although many of our record players support a USB stick, the GPO Attache is the only product that comes with a free USB stick. For any other problems, please do not hesitate to contact GPO customer service on 0330 024 0383, or submit an enquiry form on our website.